People are always so surprised when I say that I have hair extensions. It’s not something that I bring up in conversation but I have absolutely ZERO problem admitting that I have them! 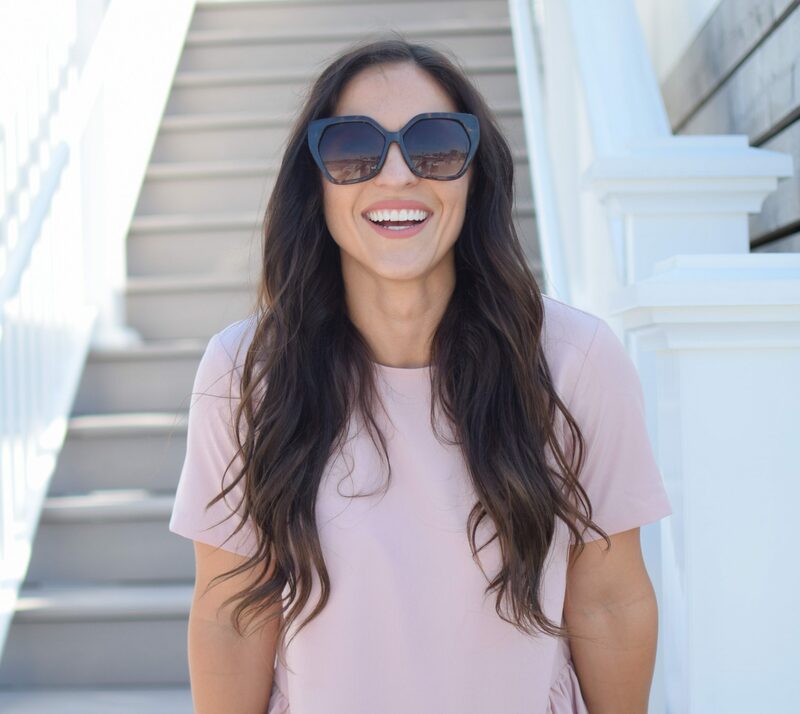 The extensions that I have are microbead hair extensions and today I’m dishing ALL the details to help you decide if they’re the right option for you. I’ve had my hair extensions in for about 5 years. YES! 5 Years! I am naturally blessed with SUPER thin hair. Thanks Dad. It always bothered me. If I curled it it looked like I had 1 curl on each side of my head. If I pulled it up I looked like I had the same amount of hair as a 2 year old. I could never get it to look good no matter WHAT I did. SO, when I got pregnant with my daughter in 2012 I decided I wanted to do something to feel really good about myself. My friend Ashley who happens to be my stylist at Salon Tsunami suggested I try hair extensions. The extensions that I have are called “Dream Catchers“. I’m going to break down how they are installed, how much they cost, what the maintenance is like and the pros and cons. Dream Catchers Hair is 100% Remy Hair and silicone free, unlike the glue-in systems. Remy Hair is real human hair and the hair cuticle is preserved unlike synthetic hair. Synthetic hair cant always take heat styling and also won’t blend well like the Remy Hair. The quality of Remy Hair is the best in my opinion and I’m sure your stylist will agree. 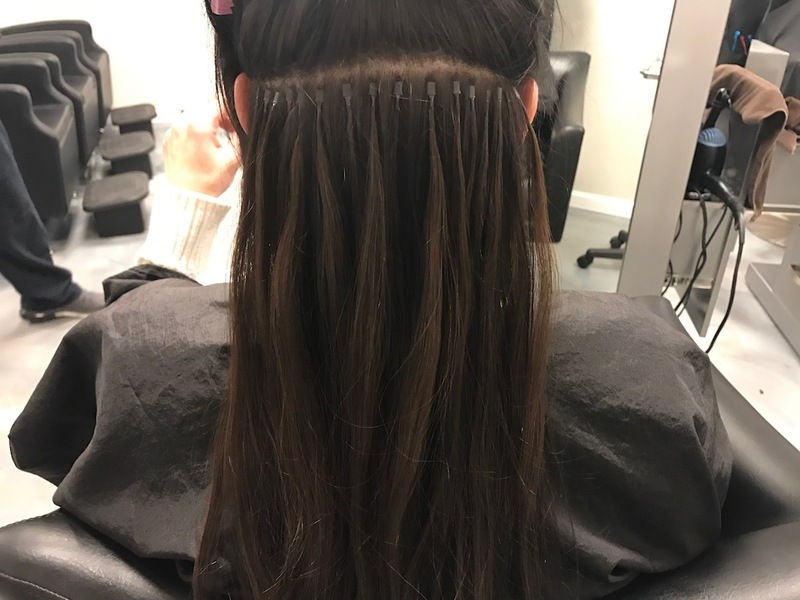 Dream Catchers also use an I-Tip System that allows your hair to lay flat against your head (picture below) creating a seamless look. Dream Catchers offers over 40 colors to choose from and the hair can still be dyed with your natural hair. For example, I get the color that most closely matches my natural hair color but if I wanted to dye my whole head once they are in I can do so. You can also choose between straight, wavy, medium curl or tight curl. To install the hair your stylist will also need micro-cylinders. The micro-cylinders are what keep the hair in place. You need one pack of micro-cylinders per pack of hair. I personally use 4 packs of hair (25 strands per pack) but you can use whatever you need. I originally started with only 2 packs and slowly worked my way up lol. My natural hair is actually just as long as the extensions but I use them for fullness, not length. Schedule a consultation. It will be impossible to get a real idea of what you need without one. 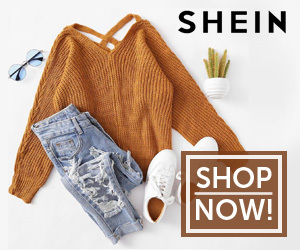 Your stylist will help you determine if you are a good candidate and if so decide how many packs and what style you need to order. Have your Extensions installed. Depending on how many packs of hair you decide to put in this could be anywhere from 45 minutes to 1.5 hours. It will all depend on how quickly your stylist likes to work. How is the hair installed? Each strand of hair slides into a microbead and the microbead is then clamped down onto the hair (see photo below). Every 4-6 weeks you will need to have your extensions “adjusted”. 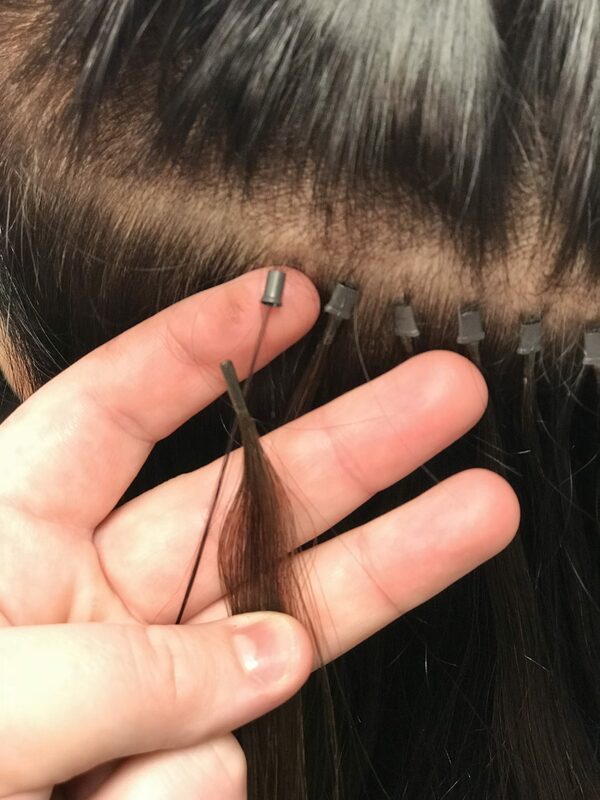 The extensions are attached to the hair at the scalp. As the hair grows the extensions grow with it. Your stylist will open up the bead, slide the hair back up to the scalp and close the bead back up. If you wait too long to have your extensions adjusted the beads start to twist and the hair between the scalp and beads can start to tangle aka dreadlock lol. You don’t want that. If you get your hair dyed then you’re probably in the salon every 4-6 weeks anyway. On average I would say you can add about 45 minutes to an hour of salon time for the adjustments. Let me just start by saying this is not going to be EXACTLY the same from salon to salon. However, it is a VERY good estimate. Ok so lets say you want 4 packs of hair. Each pack is $100 so that brings us to $400. Now you need 4 packs of microbeads (one for each pack of hair) at $3.75 each. That’s $15. Now factor in tax , which is roughly $31.50 plus shipping which is about $15. Lastly you need to factor in the cost for them to be installed. Generally, it’s $100 per pack. That’s another $400. So, overall your initial cost to purchase your hair and have them installed is about $861.5. Plus tip. Now you need to think about the monthly maintenance. I personally have to get back into the salon within 5 weeks to have my hair adjusted. By 6 weeks they feel pretty far from my scalp and I don’t like that feeling. It’s approximately $50 per pack to have your extensions adjusted. So if you have 4 packs in you’re looking at $200. Then of course if you color and cut (who doesn’t cut their hair? lol) you’ll start to see that number creep up pretty quickly! You can still use hot tools such as curling irons, straighteners, blow dryers etc. You can still pull your hair up in a bun, top knot, etc. They are much safer for your hair then other types of extensions. Will my hair extensions ever fall out? The short answer to that is no, not normally. There are occasions where I will have a strand fall out but it’s not like you’ll be walking in the food store and it will just fall out. Generally, if a strand comes out it’s for a reason. For example it wasn’t clamped in tight enough or you put conditioner on the bead (which you should never do). Usually, before it falls out you will feel that is is slowly sliding down the strand of hair and if needed you can slide it out yourself. Can I sleep like I normally would? YES! I do everything as I normally would. You don’t even know these extensions are there. 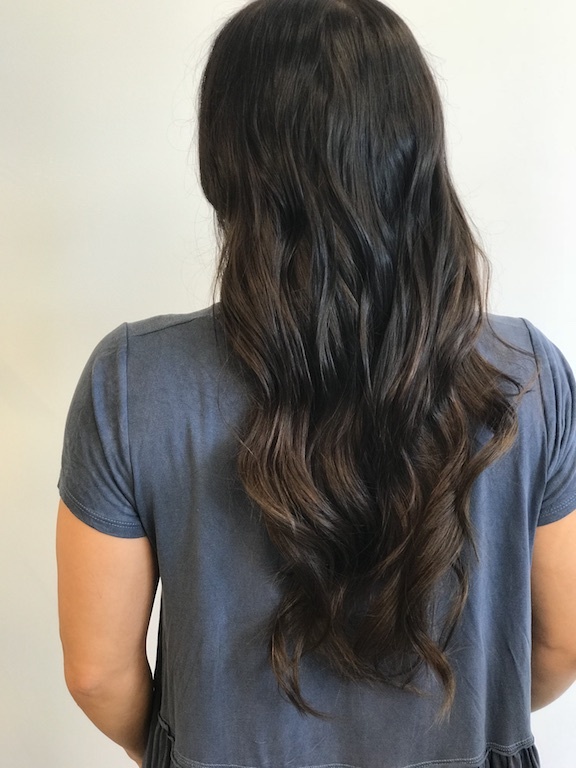 Do I need to use certain products for my hair extensions? No, but I would suggest asking your stylist which products she suggests as you should stay away from shampoos with oils or too much moisturizing agents. 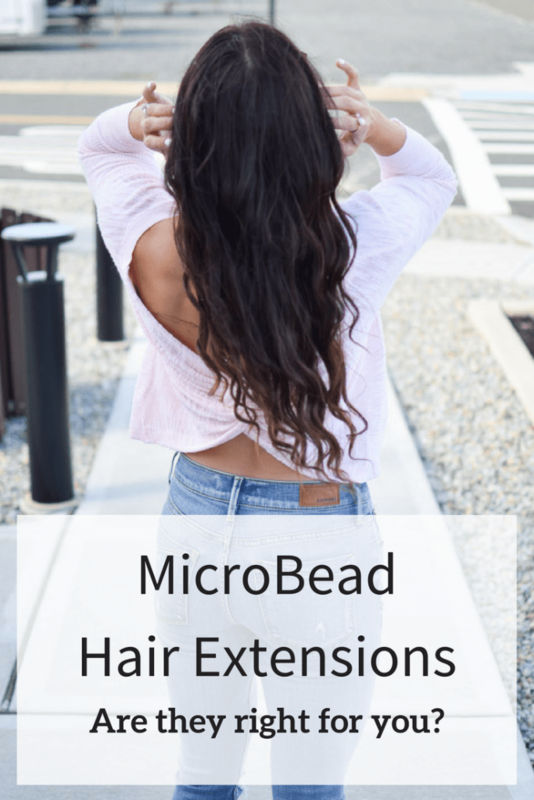 Will it be noticeable to others that I have microbead hair extensions? No. The microbeads used are the same color as the hair you choose so everything will blend together. Depending on your hair there are also different ways your stylist can attach them. How long can I use the hair for? I use my hair for about a year before I buy new hair. It will all depend on how well you take care of it. Can I brush my hair like normal? Yes. You just need to be careful around your scalp. For the top of my head I usually just tilt a bit to the side and brush. For the rest of my hair I will usually just hold my hair at the nape of my neck and brush the rest. It’s very simple. Can I use Hot Tools on my hair? YES!!! I use a blow dryer and wand (favorite wand here!) several times a week and my hair still stays healthy. If you’re interested in other types of extensions my sweet friend Ashley over at Sass and Satin has the tape-in ones! Head over and check out her latest blog post on her review. Hopefully between the two of us you can get a better idea which system is best for you. I hope you find this helpful. There are a lot of options for hair extensions and I know it can be overwhelming. If you have any questions, feel free to shoot me an email at fitmommyinheels@yahoo.com. Looking for other beauty posts? Check here. Interesting! I have never seen how they are put in. Thanks for sharing the info. Sorry I somehow missed your comment here. I’m glad you liked the post. Thanks for stopping by! Several of my extensions same type as yours have fallen out and I can see where it ripped hair from the scalp I am worried that this will thin my hair even more. Have you found that? Also how often do u do the maintenance closer to 4 or 6 weeks? Hi Jen! I try to get to the salon by 5 weeks. The absolute longest I’ll wait between appts is 6 weeks because after that they are just too far from my scalp. I haven’t had the same problem as you with the the hair ripping from the scalp. I’ve had mine for over 5 years and my hair hasn’t seemed to be any thinner that it ever was. What kind of products do you use? That could also be the issue! Can you still wear your hair like half up half down or braid your hair or do the micro beads show through? Hey Amber! I’m able to do my hair however I like. The beads are matched to your exact hair color so they don’t stand out at all. It will also depend where your stylist places them. I’ve had her start them further down and sometimes up a bit higher. As long as you find someone who’s experienced with this particular type they should be able to figure it all out for you! I have super thin hair and still don’t have issues. If you follow me on instagram you can see I wear my hair in top knots, down, low ponys, etc. !